Includes 1, 2oz Amber Glass Bottle with 1 Sprayer and 1 Glass Dropper (To use interchangeably, depending on your needs). IMPORTANT: This Peppermint oil ships 100% pure. To avoid skin irritation, we strongly suggest diluting your oil for all external skin applications using the 2% dilution guideline; which is 2% of pure peppermint oil to 98% carrier oil, or about 12 drops of peppermint oil to 1 oz of carrier oil. For other than external applications (i.e. bug sprays), we recommend a 50/50% dilution. A safe and natural repellent to many home invading insects such as ants, spiders, scorpions, mice, mosquitoes, etc. (EXTREMELY EFFECTIVE). 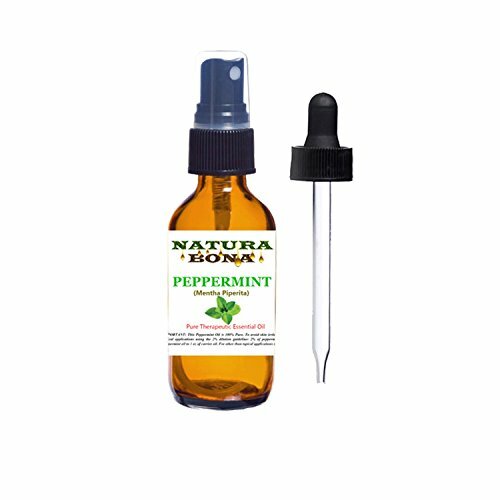 Natura Bona 2 OZ 100% PURE PEPPERMINT OIL (Mentha piperita Essential Oil). A must have FOR EVERY HOME. Versatile essential oil for both personal use and for an effective organic home bug repellent alternative. Peppermint essential oil is commonly used to naturally & effectively repel home insects & critters. Very Potent & Long Lasting! A little spray goes a long way. 100% Pure Peppermint Oil Extract. Very Strong, please dilute if necessary! DO NOT OVERSPRAY in trying to get rid of critters! A small Amount in key areas is all you'll need. CAS #008006904, FDA REGISTRATION CPIS#: F1119641 - 100% Certified Pure Essential Oil. No fillers, additives, bases or carriers added. If you have any questions about this product by Natura Bona®, contact us by completing and submitting the form below. If you are looking for a specif part number, please include it with your message.